An overview of materials for gear cutting tools. In the late 19th century, carbon, manganese, chromium, and tungsten were included to create steel that could be air-hardened, instead of needing quenching for hardness. This laid the path for today’s high-speed steels, which were first classified by the American Iron and Steel Institute (AISI) in the early 20th century. This class of steel alloy made special use of tungsten to achieve its characteristic hardness and wear resistance. Therefore, a classification such as “T1” was used, and this naming convention has evolved to today’s materials. During World War II, AISI steels were developed to utilize less expensive alloys, substituting molybdenum for tungsten, which provided the first widely used HSS classification in the gear industry. This M2-grade steel provided the standard choice for gear cutting tools of the time. This high-speed steel (HSS) could be considered “soft” by today’s standards, but at the time, the inclusion of molybdenum to the steel created a material with high wear and temperature resistance and a hardness (after heat treatment) around 60 HRC. Today, tools such as drills, taps, reamers, and saws continue to make use of M2 steel, but gear cutting tools have moved on to more sophisticated options. M42 HSS includes cobalt, which helps provide excellent hardness in the mid-60s HRC even at high temperatures. This “hot hardness” allows tools to run at higher cutting speeds, which decreases cycle times. Gear shops today use M42 cutting tools because they offer a relatively inexpensive option for “fast” cutting when compared to even harder, more wear-resistant materials like carbide. 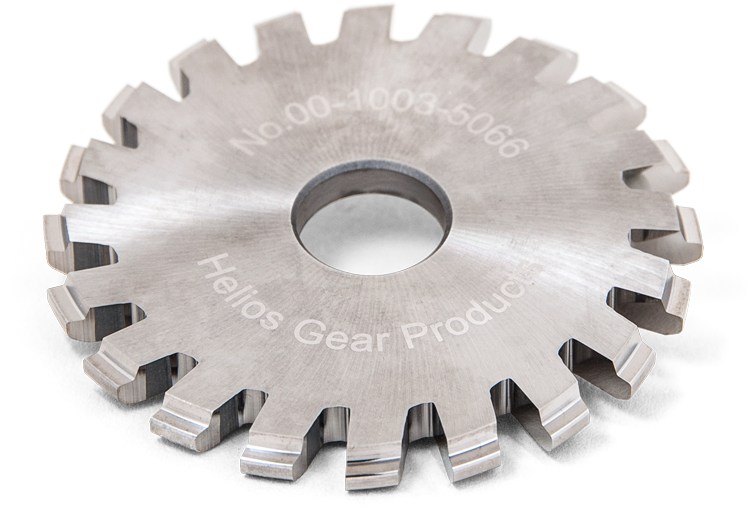 Several companies today provide a series of high-speed steel materials that compete to be used in gear cutting tools. To name only a few, Erasteel (“ASP©” metals), Bohler-Uddeholm (“S” metals), and Crucible (“CPM© REX” metals) all provide contemporary high-speed steels that are typically manufactured using a patented process, hence the variety of naming classifications. Though similar, these materials provide a range of hot hardness, wear-resistance, toughness, and cost to be considered for each gear cutting tool and its application. Over the past two decades carbide hobs have become a ubiquitous option for gear cutting tools. There are several possible “carbides,” which combine carbon atoms with other alloy elements. This industry uses the simple term “carbide” to generally mean “tungsten carbide,” chemical formula WC. In the case of a solid carbide hob or carbide insert, the composition is approximately 85–90% tungsten carbide with 10–15% cobalt. This metal provides hot hardness in the 90s HRC and much better wear-resistance compared to HSS, but at a greater expense and brittleness. The greater hot hardness means that these tools can be run at faster cutting speeds without degradation to the cutting edge. Some cutting tools make use of both HSS and carbide by using a HSS body combined with carbide inserts, which are small, recyclable cutting edges. 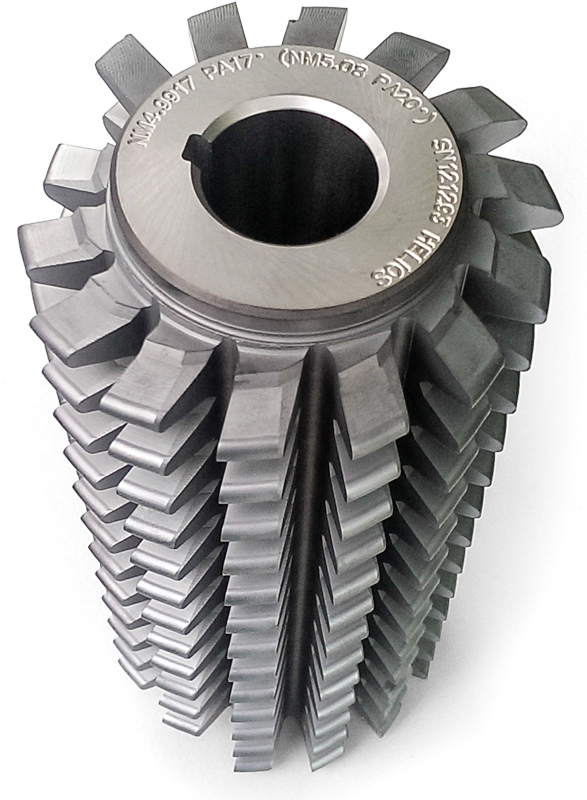 One application that requires carbide’s hardness is skiving, which is the re-hobbing of a hardened gear. Today’s cutting tool materials will continue to evolve and provide the gear manufacturing industry new options for tomorrow’s cutting applications. For example, there are new high-speed steels that promise carbide-like wear resistance at a fraction of the cost of carbide. In the meantime, cutting tool manufacturers use a wide range of established high-speed steels and carbides for gear cutters of all kinds. It remains up to the gear manufacturer and his supplier of cutting tools to determine an optimal material for gear cutting applications.